To someone who has been entranced by Ki-duk Kim from virtually the start, his lauded victory in Venice was quite a long time coming. And for those waiting with bated breath during his hiatus after 2008’s Dream (Bi-Mong) and the non-release of Arirang, Pieta is like pure oxygen – which is ironic to say because it is also like having the wind knocked right out of you. Kim’s latest is a triumph of emotional and existential depth, with a ghost of the revenge genre that Korea has adapted into a national treasure. Does that slight nod to convention make Pieta commercial? Hardly. By virtue of a peculiar sense of discretion, Kim’s film – like Michael Haneke’s Funny Games – is as grizzly in its implications, mood, texture, and psychology as a grindhouse film is in splatter effects. Like any studied artist knows, the imagination is limitless where an image is limited. Pieta balances the shock of the image with the task of imagining throughout, not only with violence, but with emotional motivation, and the variation between visual and spoken language. In small ways Pieta marks a shift in Kim’s cinema. Not a distinct leap, but certainly a lateral advance. For one thing, the mostly handheld cinematography is a bit looser, and the editing is on the whole a bit faster. There is also a newfound sense of darkness and shadow that feels like a continuation of his nocturnal exercises in Dream taken to more noir-like, if not painterly heights. Kim’s lighting – or rather his darkening – enhances Pieta’s foul and grey environs. In all the important ways though – the ways deeply rooted to his identity as a visual storyteller fascinated by the physicality and brutality of human emotion – Kim remains the same uncompromising artist. 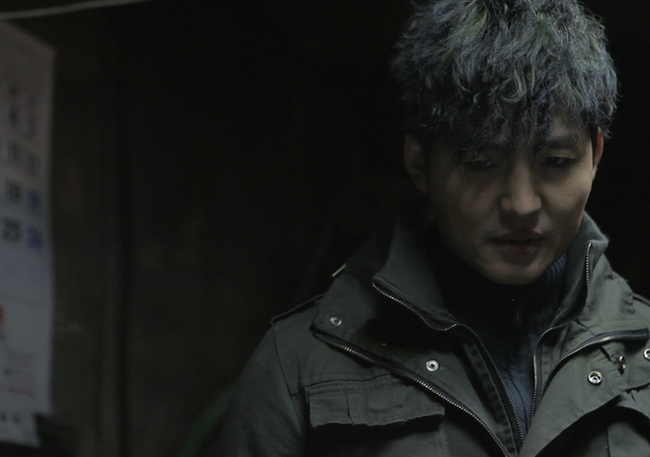 Kang-do (Lee Jung-jin in a visceral embodied performance) is a singular and singularly unsympathetic man, without family or scruples and a limited vocabulary. He works as an enforcer for a loan shark. His employer has a staggering policy which demands 10x return on all loans. Poor machinists and small-scale industrial workers take out loans to stay afloat in utter desperation, but incur the wrath of Kang-do when they are unable to pay. To recover the astronomical interests, the debtors would sign an insurance claim in the case of a handicapping, which gives Kang-do his weapon. He cripples the debtors so that they can file the claim and use that money to pay off their debt, a truly vicious but effective system. Kang-do lives a primal existence, and is likewise animalistic in his behavior. There is a touch of “a boy raised by wolves” in his demeanor, and his unblinking savagery. Even the way he eats has a primitive aspect – gutting a chicken on his bathroom floor and boiling the whole bird in a pot. Kang-do lives in an impoverished industrial section of the city, which is soon to be overtaken by skyscrapers as the city center expands. In this Kim creates a vague subtext of socio-economic disparity. Alleyways are littered with metal junk and scrap, dingy concrete, and greyness. Kim depicts something highly specific and tactile in the world of Pieta that at times feels like a black-and-white film in color. One day Kang-do is visited by a strange woman (Jo Min-su) who claims to be his mother begging for forgiveness for abandoning him at birth. The visitation of this woman stirs up emotions in Kang-do that had been fueling his cruelty all along, but now he is forced to confront them and process new ideas about his identity as a man apart, without origin or morality. He rejects her first attempts at reconciliation, but her persistence pays off by degrees. Jo Min-su is affecting and unforgettable. Like a soul stripped bare, her fragility and her strength are simultaneous, as is her mystery. Her injection into Kang-do’s life however goes both ways, and she finds herself confronting her own shadowed past. That all sounds fine and good, but in a Kim film, nothing happens easily and nothing unfolds with particular grace. In fact, Kim’s cinema is that of the gracelessness that is humanity. With newfound love comes the fear of loss, the very insecurity of possession. In short, all things contain their opposite, and hold within the seed of their negation. How long can a second chance at childhood last? Pieta has much in common with Kim’s 2006 film Samaritan Girl with its religious references (not that they reference the same religion), its sense of irony tied to those symbolisms, and in the depiction of a strained bond between a child and their only parent. Even the vengeful father figure in Samaritan Girl, mutated by his confusion and misapprehension of his daughter’s secretive illicit actions has a flavor of Kang-do’s pure pitiless spirit. Pieta also recalls Kim’s earlier works, like Address Unknown and Bad Guy, which are remarkably unsympathetic and focus on the lower classes, the impoverished, criminals, prostitutes, etc. The one thing Kim never loses sight of is the human…. the aching, screaming, brutal, silent, desperate, passionate, inconsistent human ever competing against the circumstance of existence.